* 1. Please enter your personal contact information below. Section #2 will ask for information about other members of your household, if applicable. * 3. Will you be joining us all year, or just for the High Holidays? * 5. 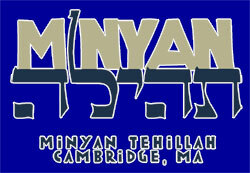 If you would like to become a member of Minyan Tehillah, please pick the option that is appropriate for you. - Only dues-paying members may VOTE on any proposals submitted to the minyan membership, including minyan elections. - These are suggested dues based on the minyan's budget. You may give any amount towards your membership but must select a membership option below to be considered a member. - The student/senior and adult rates are listed as per person rates, so please select the number of adults you are purchasing membership for. If you are purchasing membership for a child or children, please add one additional fee ($250) to cover all children. For example, a family of two non-student adults and two children would have a suggested donation amount of $710 ($230 + $230 + $250). * 7. High Holiday Childcare: Minyan Tehillah is offering childcare and programming during High Holiday services for children ages 2 and up. As in past years, the minyan is committed to subsidizing part of the cost of this childcare. You MUST pre-register your child(ren) to guarantee childcare. If you do not pre-register your child, s/he may be cared for (resources permitting) for an additional $10/day, charged after the holidays, to cover the cost of contingency planning. While we will not be providing childcare for children under the age of 2. Parents with children in that age range are welcome to use the childcare space. Please contact kids@minyantehillah.org with any questions about childcare and programming. Please note names, ages, and allergies, of all children who will be attending. Please separate multiple names with commas. * 8. While most of Tehillah’s budget comes from membership dues, we recognize that it may not work for everyone to pay these amounts for membership. Please give what you can, as we value your presence and participation, and we appreciate your generosity. Please enter the amount you are paying for your membership/ seat reservations here. * 9. Please note the amount you owe for childcare here. * 10. Total the membership, seat reservations, and childcare costs, decide how much you can contribute, and type in that amount below. Once you complete the questions on this page you will need to go to a PayPal or Square page to pay. * 11. Please confirm the number of seats you are planning on using for each holiday. Since not all members will be in town for each holiday, this information will help us to obtain an accurate count. * 12. Minyan Tehillah is committed to davening in the presence of a quorum, 10 men and 10 women, each time that we meet. In order to ensure that services can continue on time, we need a commitment from as many people as possible to arrive on time for each of our High Holiday services. Please consider coming on time for at least one service and please indicate below how many women and how many men from your family can commit to each service. Purchasing and bringing food/drinks/paper goods for post-Yom Kippur and/or Rosh Hashanah? Putting up signs directing people to the davening location prior to Rosh Hashana/ Yom Kippur? Picking up Sefer Torah before Rosh Hashana and returning the Sefer Torah after Yom Kippur? Collecting food donations around Yom Kippur? Dropping off/picking up handouts at the printer prior to Rosh Hashanah? Setting up for davening on the first and/or second day of Rosh Hashanah? Setting up for davening prior to Yom Kippur? Cleaning up after davening on the first and/or second day of Rosh Hashanah? Cleaning up after davening on Yom Kippur? Setting up, handing out, and cleaning up food on the first and/or second day of Rosh Hashanah? Setting up, handing out, and cleaning up food at the end of Yom Kippur? Purchasing and dropping off potted plants prior to Rosh Hashanah? * 14. Would you like to host one or more guests at a holiday meal during the High Holidays? * 15. Would you like to host one or more guests at a holiday meal during Sukkot? * 16. In order to offer davening and programming throughout the year, Minyan Tehillah relies on the support of numerous community volunteers. Please tell us in which of the following volunteer tasks you might be interested. * 17. If you are not currently receiving Minyan Tehillah's weekly emails and would like to be added to the email list, please check here. Please add me to the Minyan Tehillah email list. Once again, please note your total dollar amount in question #10 before continuing on to a donation page. If you are able to pay with a debit card, please use this Square link to pay. Please note on the payment page that your payment is for membership. Using Square will save our minyan money. If you would prefer to use Paypal, please use this link to pay. As links don't automatically redirect in this survey, please copy and paste either link above directly into your browser. Thank you! * 18. Feel free to add any additional comments or questions here. Shana tova u'metuka!